There’s this bird that lives in the general vicinity of our backyard. Or else he just likes to hang out here. A LOT. This bird is very talented, and he can imitate a multitude of noises that he hears around him. His favorite noises to make are car alarm noises and the sound of a garbage truck backing up. This is all fine and well, and fairly amusing and impressive. But, when he’s going full force right outside of our bedroom windows in the morning, I’m driven to do something I normally would never do: shoot something with a gun. Shoot something dead. Because, we’re not talking 7 a.m., 6 a.m. or even 5 a.m. We’re talking TWO A.M. here people. He wakes us all up at 2 or 3 a.m. and then the cats and the kid think it’s time to get up, because the birds are chirping after all! I really hope this birdie finds a new home. Fast. Or maybe the Lady Kitty will catch and eat him. One can only hope. 9:55pm In a homemade margarita haze, we decide to let Bowie jump around on the bed while we finish up NBC Thursday night TV. 10:00pm Bowie lays down with his milk. 10:10pm Bowie demands more milk. More milk procured. 10:20pm Bowie wanders in demanding to be held. He is ushered back to bed, calmed down, falls asleep. 11:00pm Apprentice is over, TV off, we try to sleep. 12:00am Hubbs work calls with a big emergency. He flips on his lamp and types away. I try to snooze, but it’s not really happening. The next couple of hours are a bit of a blur. Bowie was up and down a few times, telling me, “Mama I don’t feel.” As in, don’t feel good, because we all have a cold right now. I soothe him back to sleep a number of times. 2:30am Work problem (somewhat) resolved, lights off again. Both of us are now wide awake. We discuss random thoughts including new David Sedaris books and new Weezer albums. 3:00am Velcro [kitteh #2] is meowing at the door. Loudly. We don’t usually let her in when she comes in the middle of the night but we thought, hey, whatever. 3:02am We avoid mouse cooties and shuffle the (now obvious to us he was injured by our cat) mouse out the door. He tried to run back in, but with one last WHACK! with a book to the head from the Hubbs, he was outside again, and I am then worried about the mouse, that poor brain damaged mouse I hope he’s ok.
4:ooam About the time we’re both able to fall back asleep. 6:00am Bowie wakes up. Because that’s when he always wakes up. 6:05am Bowie lays in our bed, kicking and punching. 6:15am I take Bowie to the living room so Hubbs can sleep. I attempt to snooze while Bowie watches some TV (Parent of the Year, right here). 7:30am Hello world, meet the Wankels. All three with a cold and like, 3 hours of sleep. Today should totally rock. We’re phasing out Bowie’s nap. Before you write me off as a total masochist, you must understand, this was in response to our days beginning at 4am and ending at 10pm. 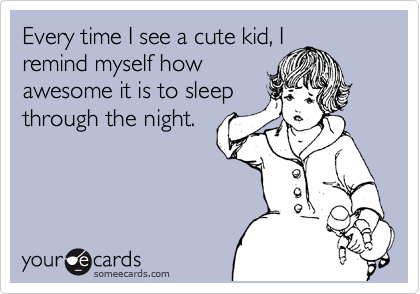 The kid (read: mommy and daddy) needed his sleep to be during the dark hours. It just seemed like his schedule needed some outside help. 1. He takes a short nap right after lunch, has a good afternoon and goes to bed on time. 2. He doesn’t take a nap at all, has an okay afternoon, falls asleep in his high chair eating dinner and thusly goes to bed early. And gets up early the next morning. 3. He acts like he doesn’t need a nap, but then falls asleep late in the afternoon on his bedroom floor or the couch or my lap and I have to wake him up, guaranteeing myself a crappy afternoon. 4. He acts like he needs a nap and asks to lay down in his crib, but then doesn’t nap, has a terrible afternoon, and screams and cries until bed time. Today is shaping up to be a number 4. But, promisingly, yesterday was kind of a 2, but he stayed up until his regular bedtime. Making me think, he’s getting this. Maybe? Hopefully? When did your children stop napping? Was it on their own, or did you have to help?